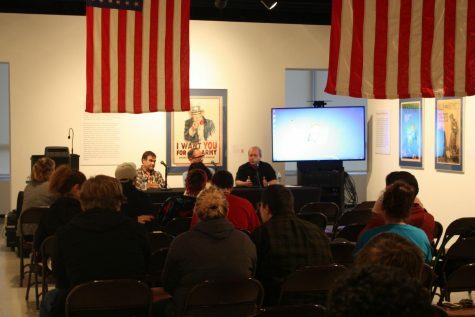 The Student Art Association and the Young Democratic Socialists, two student groups at the university, hosted a panel about the correlation between art and politics. The event took place at the Ben Shahn South Gallery, which is also hosting the World War I bicentennial gallery this semester, on Wednesday, the twenty-fifth of October. The panel was represented by Professor Alejandro Anreus, Professor George Robb, and Professor David Weisburg. The time period looked at was roughly between the 1910s to the 1960s. Professor Robb started the discussion by noting that artists are not always anti-establishment. Using the historical example of World War I, he pointed out that many artists were enthusiastic supporters of the war and volunteered to produce images for free. In contrast, it was extremely difficult for artists who were against the war to get their ideas out there. They were essentially censured from distributing negative material of the war during its course. Professor Anreus, an Art History professor specializing in Latin-American, Latino, and African-American art, discussed the combination of visual art and politics. The discussion revolved around the political thinking behind artistic images. He talked about Ben Shahn, whom the gallery is named after, as an example of an activist artist. Shahn drew a poster of Sacco & Vanzetti, two American Anarchists that had been executed on dubious charges, as a work of protest. He used Normal Rockwell and Jacob Lawrence as examples of artists who reflected on the political reality of their time in their work, in this case, during the Civil Rights movement. Both artists commented on it with different styles to encourage support for the movement. Another important aspect of art is that it can be used as a demonization of the “other” easily. Using a poster in the bicentennial gallery that depicted a German soldier as a monstrous figure, he noted that it is something that continues that is used aggressively and still used to this day. Art comes in many shapes and forms. Mr. Weisburg, a professor in the Music department, introduced into the discussion the connection between music, auditory art, and politics. He started the topic with a quote “Art is not a mirror held up to reality but a hammer with which to shape it” said by Bertolt Brecht, a German poet, playwright, and theater director during the first half of the twentieth century. He talked about how music was often pro-establishment before the 1950s. As an example, he played a part of the song, “Over There,” which was used as a recruitment tool for World War I. With musicians like Woody Guthrie, this began to change. Guthrie was a pioneer in American folk music and inspired Bob Dylan. Dylan wrote songs in his early career that emulated Guthrie’s style. Professor Weisburg played “The Death of Emmett Till” for the audience. He explained that Dylan wrote this song as a protest of the vicious murder of an African-American teenager by two white southerners. During the Q&A session, more contemporary artists were discussed. Professor Robb asked the audience what musicians they listened to who would be considered as influential, using their art to bring attention to contemporary issues. Artists such as Kendrick Lamar, Macklemore, and Beyoncé were brought up by the student audience. Art’s use as a means for marginalized communities to assert themselves was also discussed. Beyoncé’s album “Lemonade” and in particular the song “Formation” were brought up as example of combating sexism and racism in modern times. These examples show that music in popular culture is dealing with the issues faced by this generation today. The correlation between art and politics is often overlooked, but it is vital to see that the motivations behind art is rarely ars gratia artis.